Nine UTRGV students traveled to Brazil this summer for a study abroad course in cross-cultural psychology. 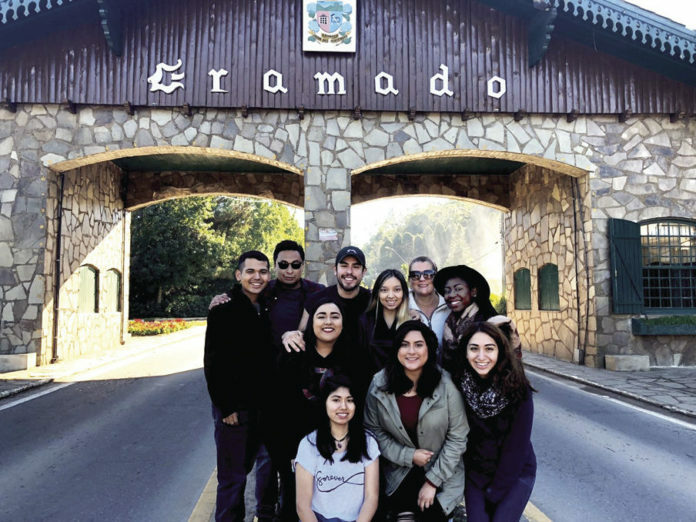 The class, led by Camilla Montoya, UTRGV psychology department lecturer was in southern Brazil, focusing on the broad mix of cultures in that region, including German and Italian and Portuguese. In addition to classes, the trip included experiences such as sightseeing, ziplining and rafting. Linda Torres, a graduate student at The University of Texas Rio Grande Valley, ziplined over the mountains of Brazil this May. Was it mentioned that Torres is afraid of heights? Torres was one of nine students who traveled to Brazil for a study abroad course in cross-cultural psychology. “We went to southern Brazil, where there’s a huge mix of cultures. Southern Brazil was mostly colonized by Germans and Italians, and Portuguese, as well,” said Camilla Montoya, the UTRGV psychology department lecturer who led the class. The region is also where Montoya is originally from. That reality led to one of the students’ first lesson about the culture. Denisse Hernandez, of Reynosa, is a UTRGV Mass Communications focusing on advertising and public relations. She and the other students very quickly learned that lesson about stereotyping based on physical attributes. Another early discovery in the course was what the students would not be able to share with their family and friends back home. Hernandez agreed, saying she enjoyed the chance to learn outside of a classroom. Torres said that, while the class focused on differences in cultures and included daily journals and group presentations, there was also a lot of introspection. Montoya said the student on the Brazil trip experience an amazing amount of personal growth in two weeks. “No one knew each other before the trip, and they’re an amazing group of friends now. They’re already planning a trip together as a group for next summer,” she said. >> Justin De Leon, junior, nursing major. >> Aimaloghi Eromosele, sophomore, biology major. >> Zarai Espinoza, junior, psychology major. >> Jose Garcia, senior, psychology major. >> Ana Garza, junior, psychology/early care and early childhood major. >> Amanda Gomez, sophomore, psychology major. >> Dennise Hernandez, senior, communications major. >> Efrain Martinez, senior, psychology major. >> Linda Torres, graduate student, psychology major.